A writer and garden designer, Stephen Switzer served an apprenticeship in the Brompton Park nursery with George London. 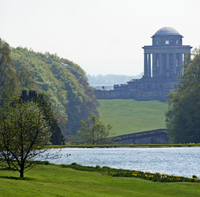 Switzer worked with the firm at Castle Howard and Blenheim. In 1715 Stephen Switzer published The Nobleman, Gentleman, and Gardener's Recreation, which became the first volume of his Ichnographia Rustica (1718). Stephen Switzer designed the garden at Grimsthorpe and his name is associated with the gardens listed below.